Although The 10 is a weekly look at what's ahead, it's worth revisiting Matt and Kim's Canalside show last night. There's no question a free concert series on the waterfront featuring widely respected bands is fantastic -- and perhaps not the easiest to organize and execute -- so it's fairly excusable when issues arise at the season's first iteration of Canalside Free Thursdays [Read Mike Farrell's review of the Matt and Kim show]. Social media complaints were loud and clear during and after the show, as calls for more vendors, shorter lines (for bathrooms, food and beer) and a more sensible setup were rampant. Boos over $5 beers -- which cost just $3 a few years ago -- were accompanied by pleas for more beverage stations. Still, a gorgeous sunset, a balanced bill of live music, a magnificent turnout and, yes, Connor McDavid -- suggest that all is not lost; it just can be improved upon. Will Canalside respond wisely? 1) Buffalo Greek Fest, 11 a.m. to midnight Friday and Saturday, noon to 9 p.m. on Sunday in and around the Hellenic Orthodox Church of the Annunciation (146 W. Utica St.). Admission is just $2. Commentary: Greek culture isn't unfamiliar in Buffalo -- we're well versed in spanakopita, souvlaki and baklava -- but Greek Fest takes the celebration a step further with traditional folk dance, tours of the Hellenic Orthodox Church of the Annunciation and lots of imported goods from Greece. And Michael Farrell somehow worked Socrates and Pete Sampras into the same sentence in his note about the three-day event. 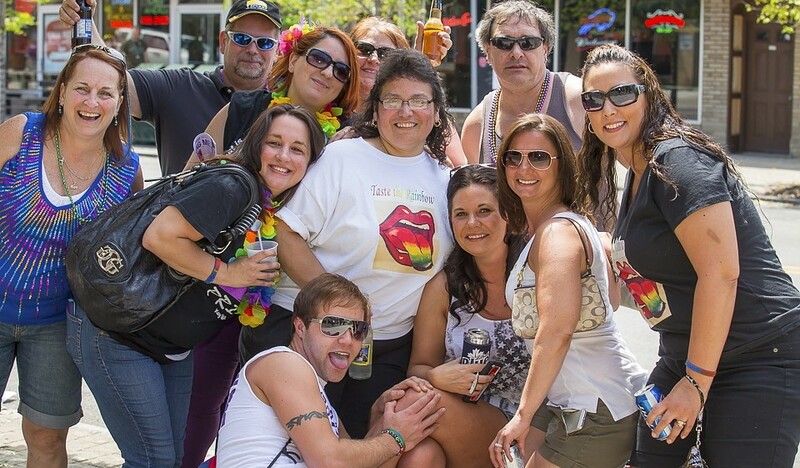 2) Buffalo Pride Festival, 1 to 7 p.m. Sunday at Canalside. $5 general admission, kids under 10 can go for free. Commentary: The festival at Canalside is the culmination of an entire week of events (check out the full slate here), and attractions like a retro dance tent, live music, food and gift vendors, and an opportunity to celebrate the LGBTQ community are all perks. 3) Namastadium, 9:30 a.m. to 2 p.m. Saturday in Ralph Wilson Stadium (One Bills Drive, Orchard Park). Tickets will be available for $30 at the stadium, and credit cards will be accepted. Proceeds support the new John R. Oishei Children's Hospital. Commentary: I don't think there's ever been a time where public yoga was hotter in Western New York, so lululemon in the Walden Galleria Mall has chosen to present Namastadium 2015 (Get it? Like "namaste" -- a Sanskrit greeting -- in a stadium, but just combined?). Here's your chance to sweat where the Bills sweat! Through Vinyasa Flow, you'll undoubtedly be more graceful than most offensive linemen. 4) South Buffalo Farmers Market, 9 a.m. to 1 p.m. Sunday in Cazenovia Park outside Cazenovia Casino. Free to attend. Commentary: After sending a photographer to shoot photos at the North Buffalo Farmers Market on Thursday [see the gallery], it feels appropriate to preview the South Buffalo version, which kicks off for a second year on Sunday. SoBo vendors like Park Edge Sweet Shoppe, Kupkates and Dog Ears Bookstore & Cafe are joined by more urban (Resurgence Brewing, The Pasta Peddler, Public Espresso) and more rural (Prudom Farms, Painted Meadow Farms and Alpine Made) choices. 5) Buffalo Bash, 8 p.m. to midnight Friday at American Red Cross (786 Delaware Ave.). Limited tickets are still available -- they run for $75 apiece -- and can be purchased at 786 Delaware until they're gone. Commentary: Formerly known as the MASH Bash, guests are still encouraged to don camouflage to the fundraiser that helps prevent, prepare for and respond to disaster in Western New York. The lineup of participating restaurants is impressive, while two drink tickets come with the price of admission. The Buffalo Bash, formerly known as the MASH Bash, returns for another year to the WNY Chapter of the American Red Cross. 6) Art Alive, noon to 2 p.m. Saturday outside the Albright-Knox Art Gallery (1285 Elmwood Ave.). It's free to attend. 7) Buffalo Superhero Race, 6 to 10 p.m. Friday in Delaware Park. You can register at St. George's Orthodox Church (corner of Amherst Street and Nottingham) between 2 and 6 p.m.; it costs $25 for the 1.8K Wellness Walk and $30 for the 5K run. Commentary: The concept doesn't need a ton of explaining: Dress as your favorite superhero and complete the run or walk without getting chased down by Wolverine (kidding, but it could happen). The race proceeds evenly benefit two mental health causes in Buffalo, one through Compeer Buffalo and another through the Mental Health Association of Erie County, Inc.
8) "Book of Mormon," 8 p.m. Friday; 2 and 8 p.m. Saturday; and 2 and 7 p.m. Sunday in Shea's Performing Arts Center (646 Main St.). Tickets can be purchased here. If you're lucky, $25 tickets to "Book of Mormon" are in reach. 9) FC Buffalo vs. the Erie Admirals, 1 p.m. Sunday at Robert E. Rich All-High Stadium (2885 Main St.). Tickets are $8 at the gate. Commentary: The local National Premier Soccer League team drew roughly 1,200 fans to All-High Stadium May 23, the highest attendance for any soccer match in Western New York since 2011's Lord Bedlington Cup friendly. Plus, the Blitzers have yet to suffer defeat in 2015, winning one match and drawing three others. Sunday's matinee against loathed rival Erie -- a team that FC Buffalo has historically struggled against -- should be a barnburner. 10) Download Gusto's concert calendar (below), which you can also print out so you don't forget about Western New York concerts big and small. There's also a wealth of digital content previewing the summer concert season for you to peruse as well.